Regensburg is located at the most northerly point of the river Danube, 130 km north east of Munich, 100 km south east of Nuernberg and has 142,000 inhabitants. Show whole map of Europe. 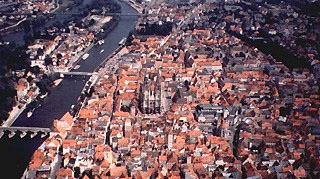 Regensburg at msn from Microsoft Inc. The city was founded by the Romans at the south of an older celtic settlement. Under emperor Marc Aurel, Castra Regina, which means the camp at the river Regen, was finished in 179 A.D. Regensburg has a medieval city center which was not destroyed during the two World Wars. 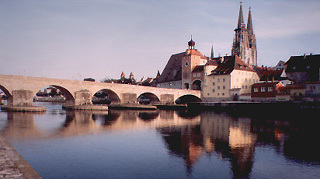 The generell view of the Stone Bridge, 1135-1146, the oldest full stone bridge in Germany (once the only Danube passage between Ulm and Vienna), in the background the gothic cathedral of St. Peter, construction of which started in 1250.